Carrie grew up in Blue Ridge, GA. She attended North Georgia College and State University where she received her Bachelor of Science in Biology. She then completed her Master of Physician Assistant at the Medical College of Georgia. As a Physician Assistant, Carrie worked in nephrology for over four years. 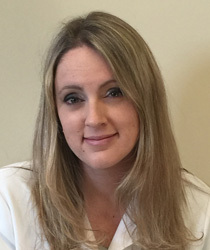 She then joined Dr. Flickinger’s practice in 2013. Carrie is a member of Georgia Society of Rheumatology, American College of Rheumatology and the American Academy of Physician Assistants. Her clinical interests include rheumatoid arthritis, psoriatic arthritis, the spondyloarthropathies, system lupus erythematosus, inflammatory myopathy (polymyositis and dermatomyositis), Sjögren’s syndrome, systemic sclerosis (scleroderma), Raynaud phenomenon, vasculitis, the crystalline arthropathies (gout and pseudogout), and osteoporosis. Her interests include hiking, traveling, and home projects.